have them shipped to you (a shipping/handling charge will apply). 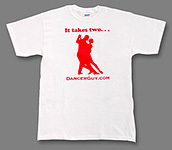 Don't Have a Dancer Guy T-Shirt Yet? 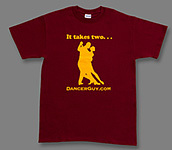 Heavyweight Ultra-CottonTM t-shirt, manufactured by Guldan Activewear, is 100% pre-shrunk cotton. 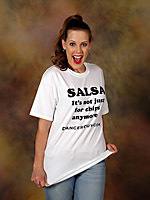 Available sizes are S, M, L, and XL. 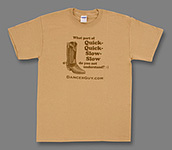 Color: Cinnamon with light gray ink. 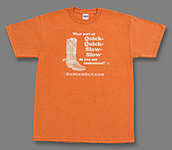 Printing: A cowboy boot with the words "What part of Quick-Quick-Slow-Slow do you not understand? :-)"
Color: Tan with brown ink. Color: Beige with black, white, and orange ink. 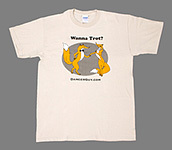 Printing: A gentleman fox asking a lady fox "Wanna trot?" 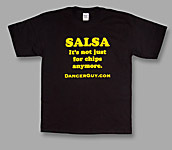 Color: Black with yellow-orange ink. 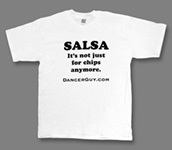 Printing: "Salsa: It's not just for chips anymore." Color: White with black ink. Color: Jade with white ink. 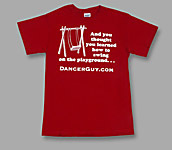 Printing: A swing set with the words "And you thought you learned how to swing on the playground. . ."
Color: Cardinal red with white ink. 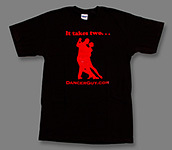 Printing: Silhouette of two tango dancers, and the words "It takes two. . ."
Color: Burgundy with yellow-orange ink. Color: White with red ink.